The DeKalb County Convention & Visitors Bureau (CVB) serves as the first point of contact for meeting planners, sports tournament directors, tour operators, special event planners, and leisure travelers. Marketing, advertising, and promotional efforts are focused 50 miles outside the bureau’s region to attract new dollars and new business, which results in a positive impact on economic development. 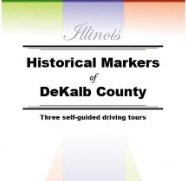 For more information on their services and the self-guided tours featured below, visit www.dekalbcountycvb.com. Our very own Waterman Winery & Vineyard is featured on the Bold Spirits tour. The Midwest is known for its craftsmen. They are the hard-working men and women who take pride in their work—rugged individuals who spend long hours driven by the desire to produce perfection with their own hands. From farming to furniture-making, industry to small business – this legendary work ethic is more than just an ideal, it’s a part of the culture. Nowhere is this pride of craftsmanship more apparent than within the brewers, wine-makers, and distillers of DeKalb County. DeKalb County is home to over 40 quilts across the county. The DeKalb County Barn Trail is broken down into five (5) legs allowing visitors to explore the self-guided tour in whatever way fits their schedule. Jump into the trails or create your own to seek out the Quilts that interest you, this Self-Guided Tour is unique one you will surely not forget! person of significant historical interest, differing from the National Register of Historic Places that recognizes significant buildings. The historical markers have been divided into three tours based on geographic location of the markers.